The Seattle Ki Society offers a dynamic children's program that emphasizes safety, smiles, and simple aikido. Basics of Ki-Aikido are taught in a traditionally disciplined yet fun setting. Our focus is on doing! Basic stretching, rolling and exercises are done by everyone. Children learn to count in Japanese and also learn the basics of aikido etiquette. Everyone gets a great workout and children learn coordination, awareness, cooperation and sportsmanship with games such as "Rope of Fire" and "Ki Ball." We offer different levels designed with the needs of various abilities level in mind. 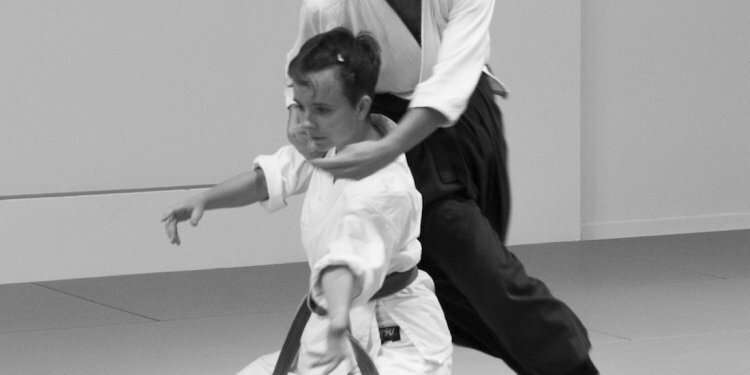 All three programs have the same learning structure as the adult program: mind and body coordination, one person exercises ('hitori waza'), and defensive techniques practiced with a partner ('kumi waza'). Children start in the introductory class, where they learn the basics to prepare them for the more advanced classes. Rank testing in aikido is performed quarterly, and a colored belt system is used to provide positive feedback and goal-setting for the children. Beginning Children's Program This class has a strong emphasis on teaching children how to use their bodies and confidently interact with others. We have lots of games and fun ways to learn aikido and ki. Basic body safety and exercises are introduced with an emphasis on teamwork and cooperation. Children learn traditional aikido etiquette and exercises to prepare them for the more advanced classes. Our goal is to help them develop coordination, cooperation, and confidence. Above all, we strive to give children a positive and safe learning environment. Intermediate Children's Program The older children's program continues the mental and physical training of the introductory program with more emphasis on the aikido techniques. This class is more disciplined and structured than the introductory class without losing the fun atmosphere. Gradually we challenge them with more advanced activities to build their conficence, personal identity, and leadership skills.